IT MAY BE ONLY a stone’s throw from the tourist magnet of Montmartre but Château Rouge couldn’t be more different. 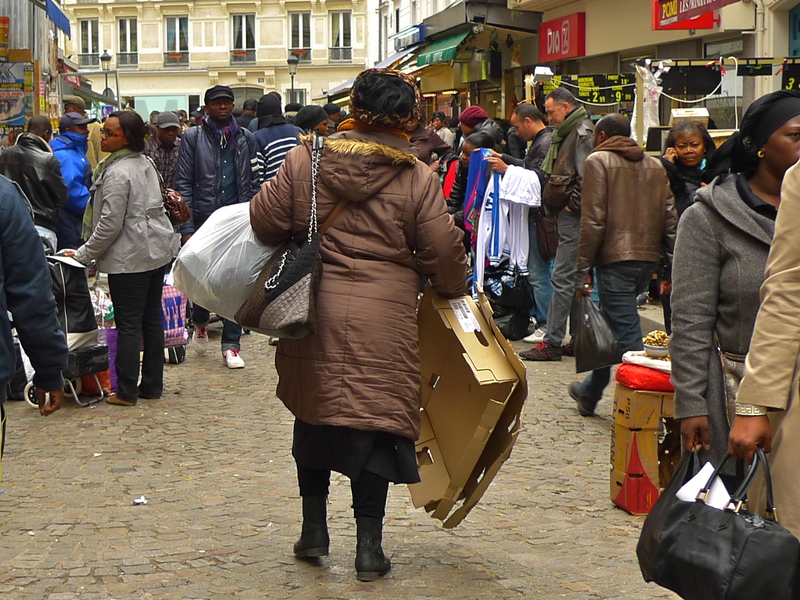 Situated in the Goutte d’Or district, Chateau Rouge is Africa in the heart of Paris. Home to immigrants from Europe in the 1950’s, Château Rouge now boasts an African community from Senegal, the Ivory Coast, Togo, the Congo, Cameroon and probably other places too. It’s said that something like thirty different languages can be heard here. 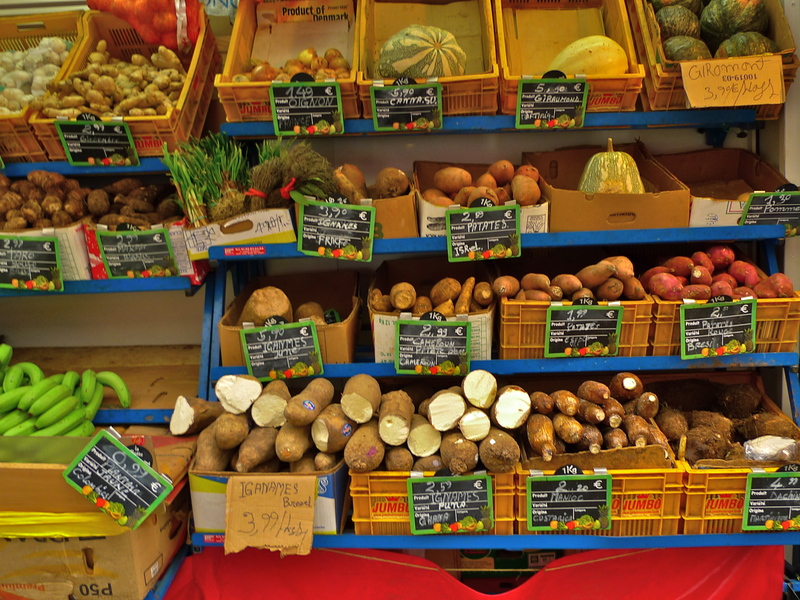 At the heart of Château Rouge is the Marché Dejean, a busy street market but one unlike any other I’ve seen – or heard – in Paris. Alighting from my train at Château Rouge Métro station I stepped onto a platform full of other people who also had the Marché Dejean firmly in their sights. The crush was so great that we had to queue to get out of the station. Emerging onto the street the cacophony of the Métro station faded and a different wave of sound enveloped me, the sound of the Marché Dejean round the corner. I could hear the market well before I could see it. 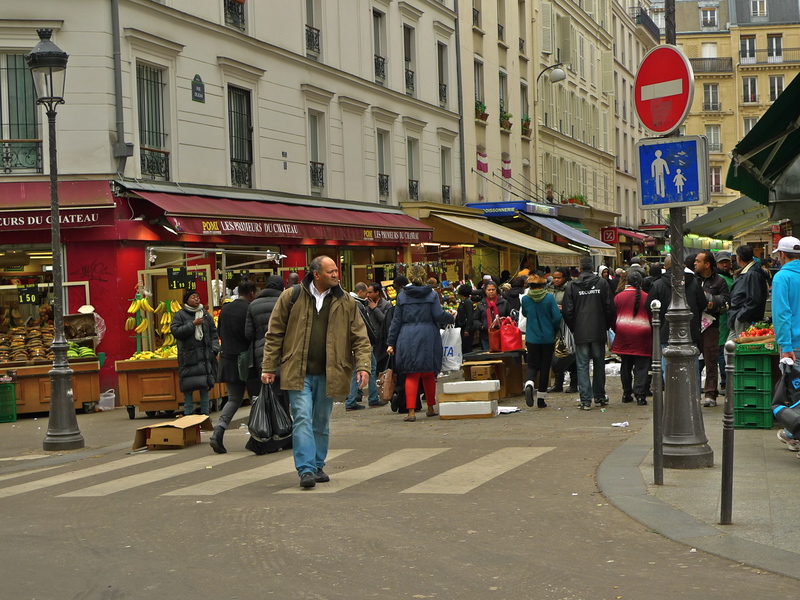 The Marché Dejean runs along the rue Dejean but it spills over into two of the neighbouring streets, rue Poulet and rue des Poissonniers and the whole area is a very rich sound environment. Regular followers of this blog will know that I enjoy soundwalks. 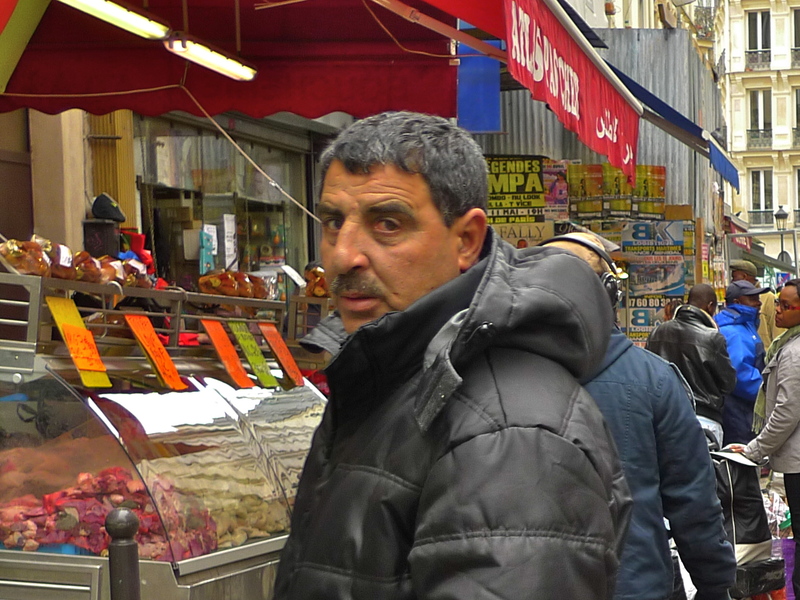 Soundwalking is one of the techniques I use to capture the sounds of Paris and particularly the sound tapestry of the city’s streets. The aim of a soundwalk is to capture the mélange of sounds that create the atmosphere of a place as well as the individual sounds that might help to define it. 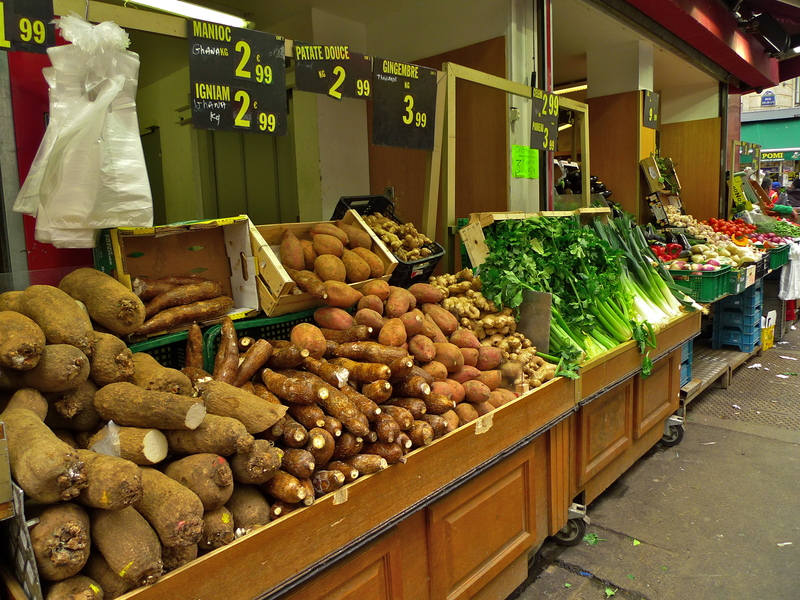 And the Marché Dejean is perfect soundwalking territory. 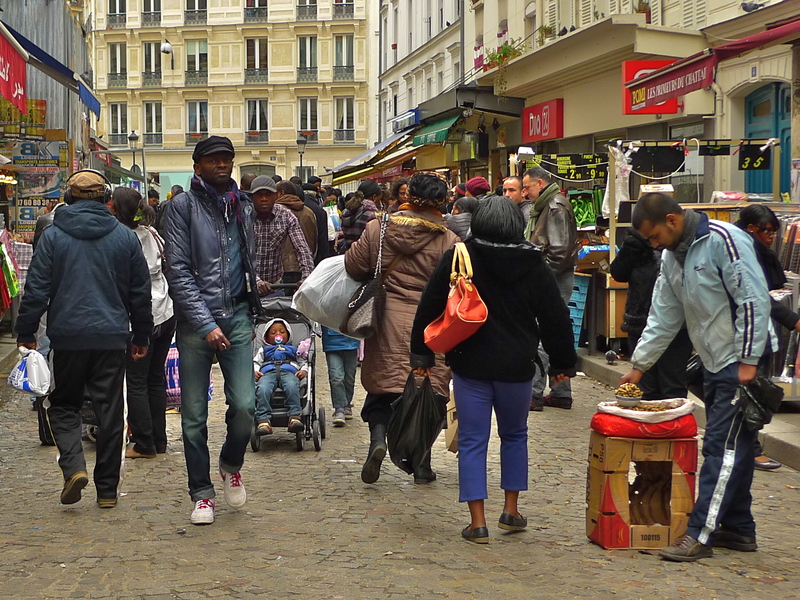 The sights and sounds of the Marché Dejean reflect its soubriquet, Little Africa. Either side of the street small retailers selling beauty products and colourful fabrics sit alongside hallal butchers and exotic food shops selling everything from fish – treadfin, tilapia and barracuda, to exotic spices and vegetables including yam, okra, manioc (cassava) and a host of other things I can’t put a name to. 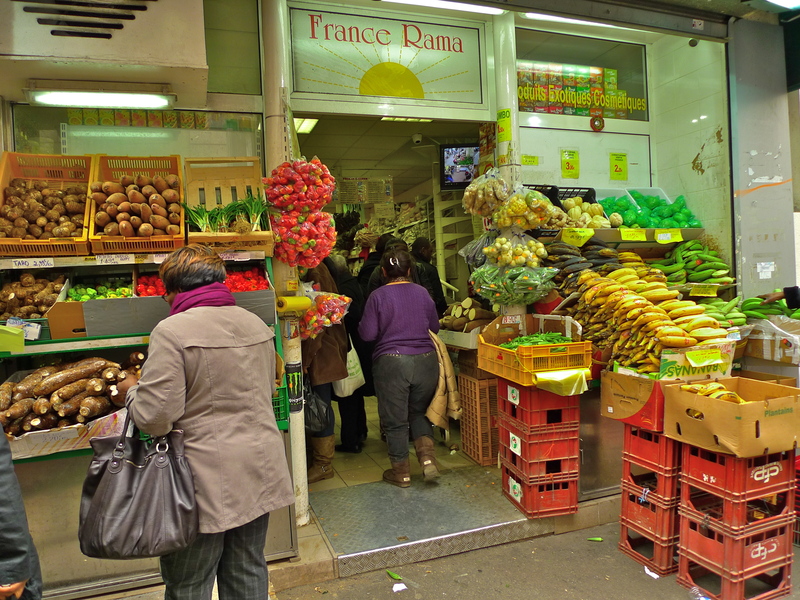 Although these shops are exotic and colourful the real sounds of the Marché Dejean are to be found in the street itself. People using upturned cardboard boxes as makeshift stalls gather in the road to sell everything from beauty products, to clothing, exotic vegetables, peanuts, watches, sunglass, handbags and even mobile phones. At the first sign of the police of course, these itinerant traders disappear in the blink of an eye only to return minutes later when the threat has passed. Taking a camera to these parts is not a good idea. I was very firmly told by an extremely large and rather menacing African gentleman that taking photographs c’est interdit – it’s not allowed. Of course it is allowed, it’s just that they don’t want you to do it – for what reason we can only guess. 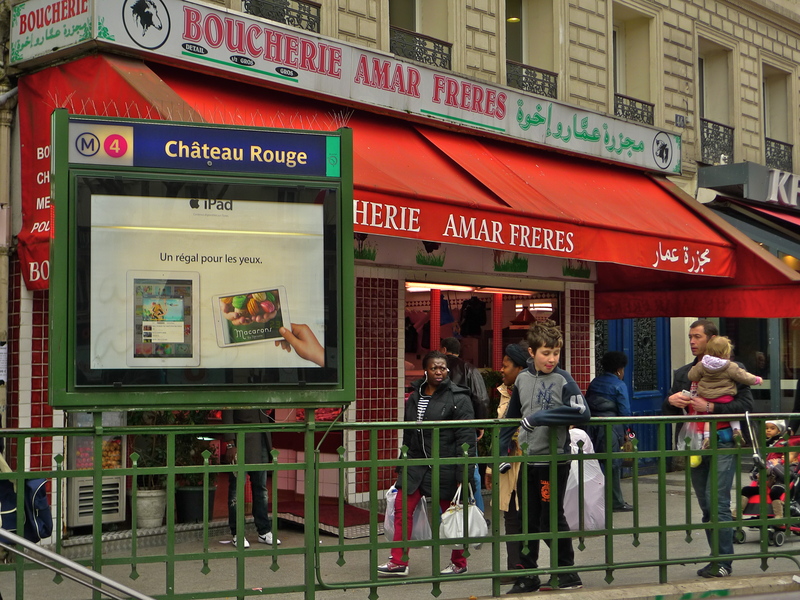 Château Rouge and the Marché Dejean with the colourful sights, which are much brighter in the summer than when I went, the exotic smells and rich sounds reflect the cultural diversity of Paris. The area is well worth a visit – but it’s perhaps best to leave the camera at home.